Event features keynote speaker Laura van Dernoot Lipsky, founder and director of The Trauma Stewardship Institute, presentation of annual Caring for Children Awards. 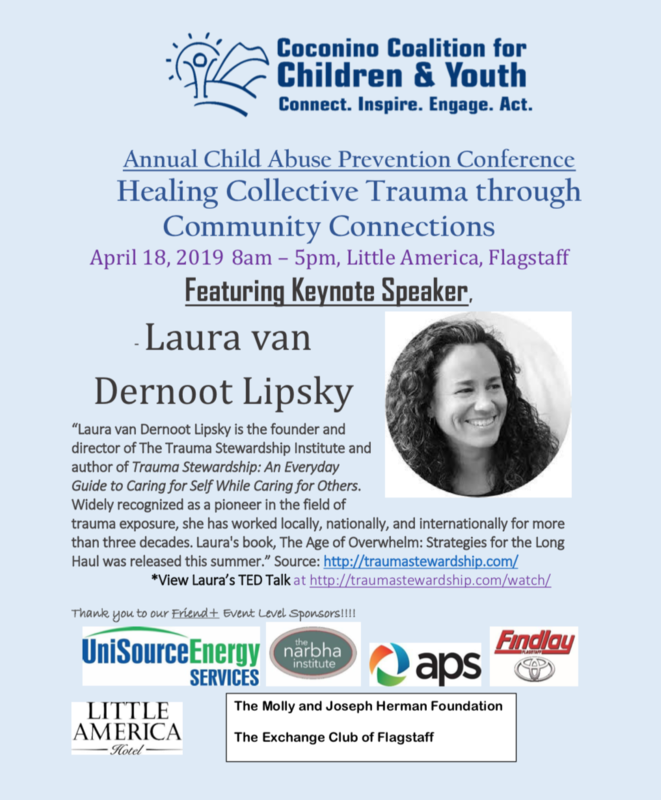 FLAGSTAFF— In recognition of April as Child Abuse Prevention Month, CCC&Y will present the 2019 Annual Child Abuse Prevention Conference and Luncheon — “Healing Collective Trauma through Community Connections,” at Little America Hotel, Flagstaff on Thursday, April 18, 2019. The conference will be held from 8 a.m. to 5 p.m. The conference will include multiple presentations including the Neurosequential Model in Cargiving, a training program to help better understand the unique, sometimes challenging needs of the children who have experienced the trauma of abuse and neglect; a look at the influence of poverty, culture and trauma on the behavior and health disparities of American Indian Youth; and an examination of the differences between new parent stress and post-partum depression. The luncheon, from noon to 2 p.m., includes brief presentations on Child Abuse Prevention by invited community leaders and a keynote discussion by Dr. Pearl Yellowman, executive director of the Navajo Nation Department of Community Development. Yellowman has provided consultation, trainings and support across a wide array of audiences and geographic locations related to trauma, historical trauma, epi-genetics, and health disparities in addition to her academic career and behavioral health work. *We do have a small selection of need-based scholarships available for foster parents and those responsible for preventing or responding to abuse in our communities. Friend+ Event Level Sponsors for this event are Unisource Energy Services, the NARBHA Institute, APS, Findlay Toyota Flagstaff, Little America, the Molly and Joseph Herman Foundation and the Exchanged Club of Flagstaff. Ongoing Partners include Steward • Health Care Network, Health Choice Arizona, Coconino County, the City of Flagstaff, the Arizona Department of Child Safety and the Flagstaff Unified School District. Proceeds from this year’s Annual Child Abuse Prevention Fundraiser and Caring for Children Awards will support CCC&Y’s prevention, community education and child advocacy efforts throughout the year. Visit https://coconinokids.org/2019-annual-child-abuse-prevention-conference/ for more information and to register for this event.